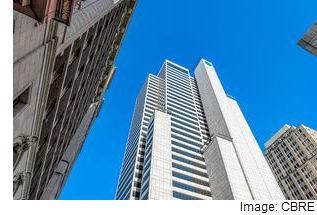 ​​​​​ DALLAS – The landmark tower and plaza that houses AT&T Inc.’s global headquarters has been purchased by Dundon Capital Partners and Woods Capital. The investment firms bought the 37-story, 965,800-sf building at 208 S. Akard St. from Icahn Enterprises. Whitacre Tower, also called One AT&T Plaza, is fully leased to the telecom giant through August 2030. The building has served as the company's headquarters since 2008, when AT&T moved ​from San Antonio. Ground-floor renovations taking place at the property are part of the $100 million AT&T Discovery District project​. ​See al​so: Dallas-Fort Worth-Arlington Office Market Research​.